The beauty of Ben Wheatley's adaptation of J.G. 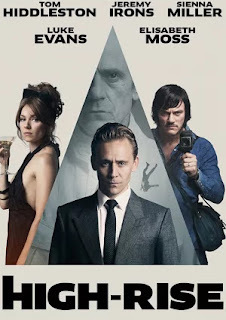 Ballard's novel "High-Rise" is in the well crafted production design and intricately designed montages. However, it's so utterly bonkers, brimming with excess in much the way the character's lives do, that it doesn't take long to stray off the rails and lose all sense of its central message about the divide among social classes. The titular tower in which the entire film takes place is, of course, a microcosm representing the separation of classes and the danger of confining them in such close quarters. It begins with a bloodied Dr. Liang (Tom Hiddleston) carefully cooking a dog's leg for supper while he cryptically explains the state of things in voice-over. The film then jumps back three months to a calmer time when he had just moved into the high-rise to be the new middle-class doctor. All that remains is the slow decay into the desperate state the film started out in, and it does so in graphic detail. The important characters living around him are the ones that give us the best sense of world. Living above him is the oft partying, single mother Charlotte (Sienna Miller); living a floor below is the unhappily married parents of a gaggle of children, Helen (Elisabeth Moss) and Wilder (Luke Evans); and living at the very top of the tower is the building's reclusive architect Royal (Jeremy Irons), who clearly regrets what his work has become. They all have frequent interactions with Liang for various reasons, but the film is at its best in the first half when it's maintaining Laing's perspective on this bizarre place. In fact, the film stumbles in the second half when it shifts perspectives frequently between the aforementioned side characters leaving Liang for lengthy amounts of time. As far as its social commentary goes, this film is all over the place, but it seems mostly concerned with the excessive lives these people live, no matter the social status. In fact, despite having characters outright state that they want to move up the tower, the film does a poor job establishing the negative conditions of the lower levels. Instead it spends its time showing high society parties with their colonial attire and string quartet music, contrasted with middle class parties involving lots of drinking, dancing and rock and roll music. There seems to be fights over class simply for the sake of fights over class. The fact that the film is so scattershot means there's very little time for properly establishing any discontent. Rather director Ben Wheatley plays up all the excess with his own artistic excesses. He clearly has a penchant for elaborately designed and eerie montages that feature beautiful compositions even if they're cut together with disturbing images. At any time there is likely to be bloody brawls and wild orgies happening at the same time just floors apart. While these montages are clearly the work of a talented visual artist, they amount to empty calories. There is no overarching lesson to be learned, nor unifying theme. These characters aren't particularly likable, and all of them lack clear motivations. "High-Rise" might be a visual treat with its distinct 70's vibe and Wheatley's pretty looking montages, but it pales in comparison to other films on this subject (of which there are many). The comparison that continually comes up with this film is Bong Joon-Ho's "Snowpiercer." Rather than a high-rise, the microcosm existed on a constantly moving train. The difference is that "Snowpiercer" moved with intent, and better established the state of its classes. Both films feature beautiful set design, but "Snowpiercer" did more with its premise than create a collection of pretty montages.